'today is night without the darkness' and "the fish and chip lady sings 'love me tender' over the splutter of fat', what do the two lines mean? Really can't understand it. Thank you for your help. A tropical beach is virtually deserted at night and when it's raining. 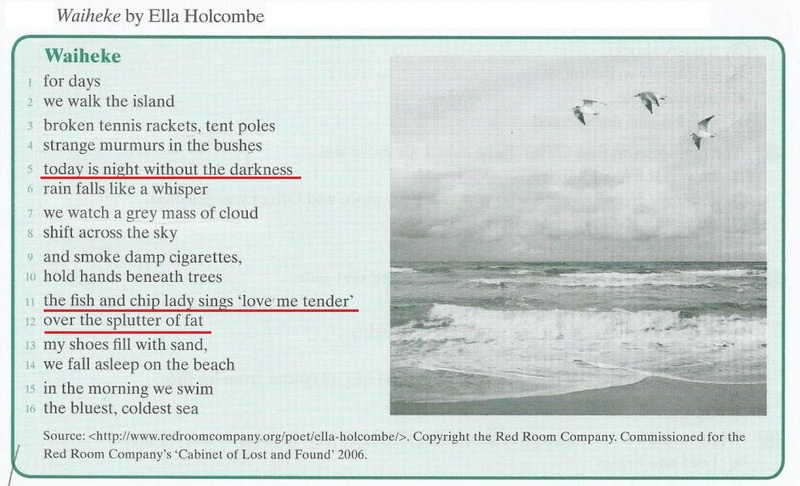 Thus the poet can compare a beach scene with no people about and where there is a light rain with grey clouds moving across the sky to a "night without darkness." The literary device employed is oxymoron: the chief quality of night, i.e., that it's dark, is negated, forcing the reader to resolve the paradox by thinking of other qualities, such as quietness and lack of human activity. Your second question deals with two cultural allusions: 1) to the humble British dish of batter-fried fish and fried potato wedges, the onomatopoeia"splutter" referencing the sound made when food containing any moisture is dropped into hot fat, and 2) to the 1956 hit song by Elvis Presley "Love Me Tender." Not the answer you're looking for? Browse other questions tagged reading comprehension or ask your own question.